Lauki soup is a great recipe for weight loss and maintaining a healthy digestive system. This delicious lauki soup recipe is very simple to make — Just cook all the ingredients together in a pressure cooker, and then blend to smooth. Gourd vegetables, especially Lauki (also known as Dudhi, Bottle gourd and White gourd) is amongst the healthiest vegetable. High fibre and water content makes lauki an ideal vegetable for detox and weight loss diets. In addition this simple lauki soup recipe packs in the health benefits of turmeric which is a great anti-inflammatory food and naturally boosts body’s immunity against common diseases. Turmeric is also a cancer-fighting superfood. But Lauki is not popular amongst picky eaters specially children. As a kid, the only form in which I ate dudhi was as lauki kofta curry – deep fried grated bottle gourd dumplings. This easy bottle gourd soup is a great way of including lauki in meals, either as a side or the whole meal itself. 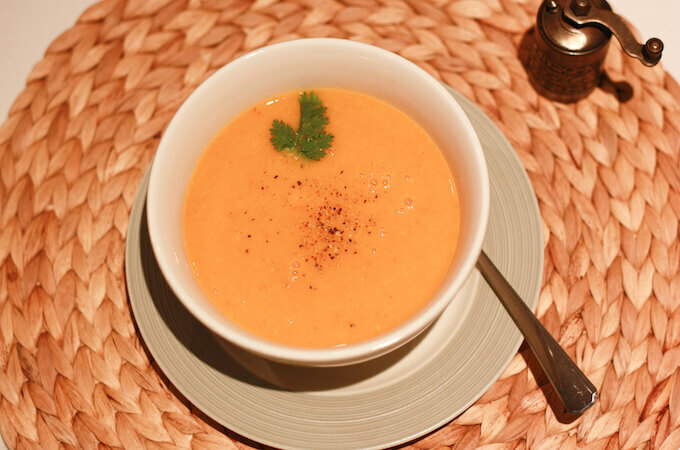 Especially during winters, a soup dinner night is very comforting. 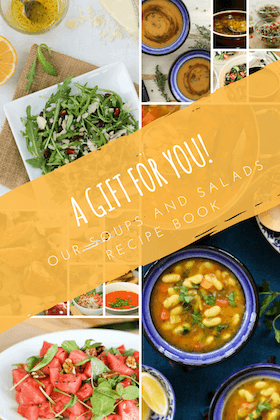 I have only recently started learning different soup and salad recipes — Indian as well as those inspired by our travels and the local; produce available in the various countries we live in. They are perfect for a light lunch or dinner. 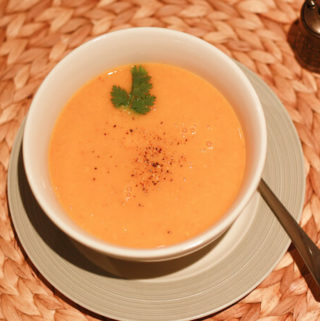 Starting with the humble Indian style tomato soup, I have slowly added quite a few simple, and healthy soup recipes to our meals like spinach soup, mushroom soup, red lentil soup, and many more. Lauki soup is great for weight loss and healthy digestion. This delicious lauki soup recipe is the easiest— Just pressure cook all ingredients together & blend to smooth. Heat oil in a pressure cooker. Once the oil is hot, add all the vegetables, little salt and turmeric powder. Mix well. Sauté for 2 minutes, add 2 cups water, close the cooker and pressure cook for 3-4 whistles. If using a open stock pot, cover and cook for about 15-20 minutes till the bottle gourd is tender. Remove the pressure cooker from heat and open the cooker only after all the steam has escaped on its own. Pour into the pan, through a sieve. Season with salt, pepper and lemon juice and bring to a light boil on low flame. Transfer to bowls and serve hot. In this recipe I strained the soup for a smooth texture; but sometimes I don’t strain to keep it a bit chunky. Not straining also retains all the fibre of the lauki soup. You can also substitute lauki with turai or ridged gourd which is also a highly alkaline vegetable and great for both weight loss and detox. Bottle gourd (Lauki/Dudhi) is low in fat and cholesterol and high in dietary fibre. Eating lauki keeps you full for a long time, helps control appetite and thus results in weight loss. Lauki is 96% water, which makes it very soothing for the stomach and easy to digest. It is highly alkaline and helps reducing acidity in the stomach. It is rich in iron, vitamin C & B complex, has sodium and potassium. It is excellent for detox and low-cal diets and highly effective against constipation and other digestive disorders. Did you make this healthy lauki soup recipe? Yesterday evening, I was very hungry and wanted to have some soup.. So I did a quick short cut on the bottle gourd soup. I didn’t use any onions, garlic or ginger. Just tomatoes, spices and bottle gourd. After grinding it in a mixer, I didn’t even pass it through the sieve. As a result it was thick with a lot of fibre. It was off course different in taste from the original, but I like it this time as well! 🙂 And it took hardly 10 minutes! Ashima did u boil lauki in cooker??? Yes I boiled everything together in cooker. Lauki doesn’t take long.. You may choose to use only lauki and tomato .. it will be done in 2 whistles or so..
you are most welcome surbhi! 🙂 How did it turn out? Is Cooker is necessary ? I will make it for my mom …..thanks dear ….. Does boiled Lauki juice useful to the blood pressure or heart patients? Lauki juice is an effective preventive medicine for cardiovascular diseases and also for high blood pressure.. I found a lot of websites on benefits of Bottle gourd.. Here is also a research paper published in Indian Journal of Experimental Biology that I found online http://goodnewsheartpatients.com/bottlegourdresearchpaper.pdf. Thank you for the recipe – a nice way to use lauki. I brought in a variation – instead of water I used some curds, that gave it a lovely smooth and thick consistency. Do try it. Thanks so much for suggesting this twist 🙂 Lauki ka soup is one of our favorite soup recipes and the easiest one too ;p. Glad you liked it.. Will try your suggestion soon! What do you want recipe suggestions on? I will be able to give suggestions if you can share maybe what course you are looking ideas for, what ingredients do you want to use.. etc.. I will be trying it tonight.. Does having cooked bottle gourd (i.e. soup) and raw bottle gourd(i.e., juice) make any difference in terms of nutrition values? So I have to put the disclaimer right up front that I am not a nutritionist. Now, in my opinion, raw will surely preserve the nutrition more than cooked. Bottle gourd juice has since long been recommended for weight loss and also for diabetic patients. We have recently moved to a naturopathy diet and Lauki is big in that.. I don’t hate lauki and it was always a part of our regular food but now we have actually started loving it. We even eat it raw in grated salads and it tastes amazing. I will soon start writing about our explorations into Ayurveda and share more recipes with lauki. Thanks a ton for this life saver Ashima.. The variation i tried was just boil it all with half a teaspoon of oil and later seasoned it with some cumin pepper and salt in half a teaspoon oil. I loved it! Thank you for sharing your thoughts and also rating the recipe. It really encourages me! Tried this today. Tastes amazing. Added spring onions as garnish and they added a great crunch and taste. Thanks for the recipe. Spring onions would definitely be a great addition 🙂 Thanks for the idea! I will do it to next time!